After the declaration of war with Germany on the 4th August 1914, a British Expeditionary Force left Bordon and landed in France on 22nd August 1914. They were replaced by Canadian troops who occupied the military site until June 1919. In June 1915 the Canadian Overseas Railway Construction Corps arrived in Longmoor. Later in June 1917 118 Coy Canadian Forestry Corps set up a sawmill in Liphiook Road and they were aided by 137 Coy Canadian Forestry Corps who arrived in January 1918. At the outbreak of the 2nd World War, with the departure of a British Expeditionary Force, the Canadian Army again took over Bordon Garrison. They extended the accommodation by building Upper Oakhanger camp in the area of Bolley Avenue and Lower Oakhanger Camp in Station Road, where Havannah Officers' Mess now stands. The latter camp initially housed Canadians, but towards the end of the war it became a German Prisoner of War Camp. On the outbreak of the 1939-45 War, the 3 rd Infantry Brigade was in Bordon. However, on its departure to join the British Expeditionary Force the Canadian Army virtually took over Bordon, although a British Officer Brigadier W J O'B Daunt was appointed Commander Bordon and Longmoor Sub-Area, formed in September 1939. 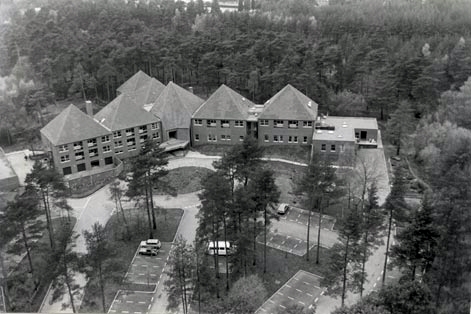 This was changed to Bordon Sub-District in May 1943, and was located at Batts Hall, Frensham. In January 1945 Bordon came under the command of South Aldershot Sub-District, with Brigadier F A V Copland-Griffiths DSO MC in command. Two more camps were built in Bordon during the 1939-45 War, but have since disappeared. Upper Oakhanger Camp was on the site of the present married officers' quarters in Bolley Avenue and was occupied by the Canadians until after the war. Then the Ministry of Supply occupied it to conduct the sale of surplus Army vehicles, gathered together and covering the whole of Slab Common. The camp was dismantled in about 1950 to make way for officers' quarters (Nos 5 - 20 Bolley Avenue). Lower Oakhanger Camp, situated below the level crossing in Station Road, was also occupied by the Canadians until the latter end of the war, when it became a German POW camp. After the war it was used by European Volunteer Workers who left in the mid-fifties, when it was dismantled and used as a helicopter practice landing ground by RAF Odiham. The School of Electrical and Mechanical Engineers Officers' Mess (now called Havannah Officers' Mess) was built on the site in 1979. In 1941 Col Secord was given the task of organising 1 Canadian Base Workshop, the first over seas and destined to become the largest military workshop in the British Empire. It was situated in Budds Lane and in 1942 the corner stone was laid by Gen. McNaughton of the 1st Canadian Army. Men came from Camp Borden in Canada after training and formed1 Canadian Base Workshop which occupied these buildings. Almost any engineering task could be carried out here. By 1944 there were 3,100 staff and much equipment and vehicles were stockpiled ready for the invasion of Europe on D Day 1944. 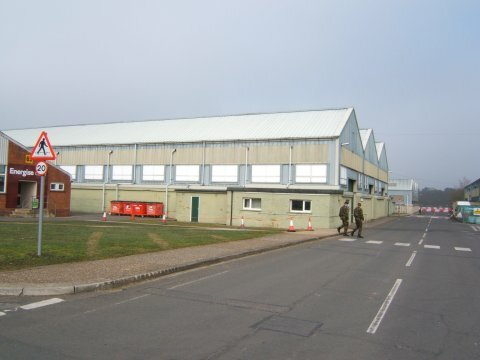 The Canadians departed in 1946 and the depot was taken over by units who later formed REME and the site became the Technical Training Area in Budds lane and Oakhanger Road. 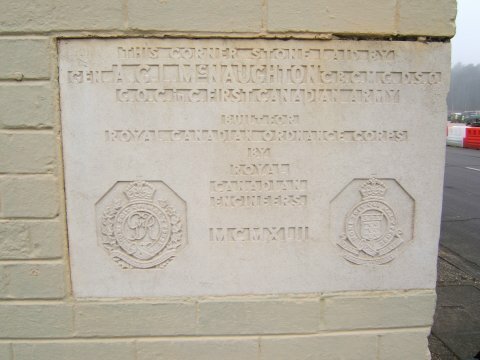 The corner stone was removed by the last Canadian Major who was posted to the Garrison in 2015.